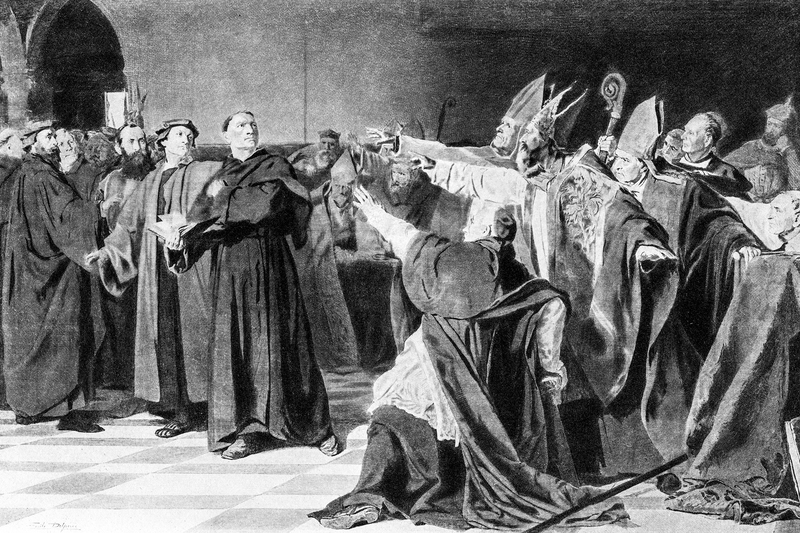 Martin Luther’s dramatic challenge to the Catholic Church in 1517 was a watershed event that brought rapid change to the German church. It reached crescendo through the labors of Luther, John Calvin, Ulrich Zwingli, and a cast of thousands. The force of this Word-centric revival of the gospel continues to ripple into our day. 1. Church structure: The changes to the structure of the Christian church were dramatic. As both Protestants and Catholics realized institutional reunion would be impossible, the church divided. Out of these new European churches, the various denominations would arise. 2. Recovering justification: Through his study of the Greek New Testament, Luther discovered “the righteousness of God” in Romans meant not the purity of God by which He will judge us but rather a righteousness which He will impart to all those who repent of their sins and trust in Christ. The embrace of this precious and all-encompassing insight has resulted in the modern missionary movement and a passion for personal evangelism. 3. Elevation of the sermon: People needed to know how they could be made right with God by faith alone. To communicate this truth and, indeed, all of Scripture, the reformers elevated the sermon in the church’s gathered worship. Preaching in the medieval church was not central to worship, and the sermons were often written by church authorities and read by the local clergy. The reformers, especially Calvin, gave birth to the expository sermon. 4. Priesthood of all believers: The Reformation renewed awareness of the privileged possession of every Christian—direct communion with God, without the mediation of a human priest. The reformers did not devalue the role of pastors or the church. But they did re-emphasize the New Testament doctrine of the priesthood of all believers, priests to one another and before God. 5. Ending the sacred/secular divide: Before the Reformation, there was a chasm between the sacred and the secular. Reformers, on the other hand, encouraged workers to recognize their labor, no matter how seemingly humble, mattered to God and contributed to His kingdom. This view transformed all work into a “dignified and glorious means of praising and affirming God in and through his creation, while adding further to its well-being,” writes theologian Alister McGrath in Spirituality in an Age of Change. William Tyndale said that while preaching and washing dishes were different tasks, there was no difference between them in terms of pleasing God. Calvin praised mothers as they faithfully cared for their children. 6. Worship services: The music in churches shifted from professional musicians (cathedral choirs and court musicians) to congregational singing. Songs were translated into the local language so all could sing and understand. Psalms were sung, and hymns were written. The spoken liturgy was also translated into the vernacular. Simplicity ruled church interiors, as images and paintings were eliminated. 7. Educational developments: General education was encouraged by all of the reformers, and Luther’s co-worker Philip Melanchthon developed systems for educational change. The school system of Germany was thoroughly reshaped. This attention to the lower levels of education brought heightened attention to the universities and their scholars. Though their founding preceded the Reformation, universities flourished under Protestant oversight. Many of today’s universities and even our systems of schools owe their existence to the Reformation. 8. Literacy boom: The reformers encouraged all Christians to become literate, so that the plowman and the milkmaid would be able to read the Bible for themselves. Though the reformers did not live to see the full fruition of their vision, we see it today in international Bible societies, missionaries, and everyday Christians helping others learn to read. High levels of literacy in the modern world can be traced to this desire to bring God’s Word into every life. 9. Scientific growth: The new thought structures brought about by the Reformation were crucial to the development of modern science. The reformers’ emphasis on returning to the Scriptures encouraged those studying nature to move beyond the ancient authorities and study nature directly. Further, the reformers’ emphasis on all vocations being a calling of God justified experimentation in the study of nature. England, Holland, and Protestant pockets of France were the leaders in the scientific revolution. These areas, those most deeply influenced by the Reformation, were the perfect medium for the growth of scientific thought. 10. Supremacy of Scripture: Unmistakably, the greatest contribution the Reformation has made to our modern world was its radical focus upon the Word of God. The Gutenberg press was certainly a contributor, but the great power exhibited in this revival emanated from its Spirit-filled, Word-centric leaders. The European Renaissance renewed interest in ancient texts. As scholars discovered seminal texts in literature, philosophy, history, and science, they were passionate to learn their original languages, especially Greek. This led to fresh and direct interaction with Scripture and revived the notion of Scripture’s primacy. The reformers did not jettison tradition, but they taught that the final arbiter of all church matters must be Scripture alone. The Word of God shaped the preaching, the singing, and indeed the very lives of its listeners. We can see the 16th-century church as it was reformed by the providential re-emergence of the Bible and its authority. May it continue to be so today. RAY VAN NESTE is professor of biblical studies and director of the Ryan Center for Biblical Studies at Union University in Jackson, Tennessee. J. MICHAEL GARRETT is the assistant director of the Ryan Center for Biblical Studies at Union University.